The World of Lazarus campaign setting for the Modern AGE roleplaying game is almost ready for launch. As our very first supplement and setting for Modern AGE, we’re both proud and nervous, but being huge fans of the critically-acclaimed comic book, we’re more excited than anything. 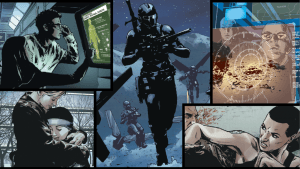 For those of you who haven’t yet read Greg Rucka and Michael Lark’s comic series, Lazarus is a dystopian, near-future world that is deeply divided between the haves and the have-nots. The comic paints a broad picture of an eerily realistic future, with a handful of corporate oligarchs ruling over the teeming masses in a world ravaged by climate change, disease, and war. While it doesn’t provide many opportunities to bust out the rules for magic and psychic abilities found in the Modern AGE core rulebook (or maybe it does; it’s your campaign), it provides a lot of other elements that make for a great roleplaying game setting. Lazarus is cyberpunk, but that incredible technology is only available to the most powerful figures on Earth, and those directly useful to them. Genetic engineering, cybernetic, quantum computer—these are all technologies mastered by the Families who rule to world, but are only available to their most trusted assets. Lazarus is post-apocalyptic, but only to those who can’t buy their way out of its impact. War, pandemics, and super-storms have wiped out large swathes of the population and rendered once-bustling cities into ghost towns. The wealthy and powerful can insulate themselves from the decay, living in technological utopias and living lives familiar to us here in the 21st century—working 9-to-five jobs, picking up dinner, and relaxing to browse social media. But those without means, the vast majority of humanity, live hand-to-mouth in grueling, nearly medieval conditions or else go off the grid entirely to scavenge and hunt a living in the fallen ruins of the old world. Lazarus is political thriller, where the actions of people on-high dramatically impacting the lives of those below them, but also where the actions of the teeming masses make the powerful sweat and toss in their sleep. The wealthy are held up by sophisticated social machines, and anything that throws a wrench in those gears threatens to topple their empire. Intrigue and quiet deals with the devil happen at all social levels, and test characters’ resolve and morals. This is a fun, flavorful world ripe for a hundred possible campaigns, from Serf soldiers fighting a war with next-gen technology to desperate Waste survivors eking out a living and exploring ruins to maybe, finally strike it rich enough to know comfort. We didn’t have room for a character creation example in World of Lazarus itself, so please indulge me while I run through a quick character to show how easy it can be and how character creation shapes the kinds of campaign’s you’ll run. I’ll generate Carrie Morrow, starting off with just a name because it makes it easier to reference her as we build. And also because I like the name Carrie. I can swap any two scores, but I’m going to hold off for now. Right now Carrie is a decent scrapper, charming, and has a keen eye, so lots of ways this character can go depending on what else we roll up for her, but I’m thinking whatever her background, she’s been to the school of hard knocks and learned most of life’s lessons the hard way. To roll her background, we need to know Carrie’s social class, and to know that we need to know what kind of campaign the GM wants to run. World of Lazarus offers for main campaign models—Family, Serf, Waste, and Resistance—with each model having difference focuses and challenges. Let’s go for a Family campaign, because I like the idea of Carrie stumbling through complex family politics with her respectable Communication and poor Willpower. Let’s say the campaign is about the Quinns, a Junior Signatory Family in service to the Carlyles, left to run the Borderland South Sub-Domain as Stephen Carlyle left to replace his father in leading the Family and the war with Hock escalates. So Carrie is a toadie to the Family. I can work with that. A Retainer gets +1 Intelligence, either the Communication (persuasion) or Intelligence (homemaking) focus, and Novice ranks in either the Contacts or Social Survivor talent (another new addition to this book). I’ll go for Communications (persuasion) and the Contacts talent. A roll on the Retainer table also gives us a 9 for the Intelligence (law) focus. Let’s Roll a middle-class profession. Because Lazarus adds extra Professions, we roll 1d6 and then a second 1d6, getting a 5 and a 4: A Breacher. This is another new option in World of Lazarus, basically amounting to a specialist at getting into and out of complex systems—a sort of high-end professional thief or corporate espionage artist; not where I expected this character to go. A Breacher gets 15+Con Health, starting Resources of 6, a choice of the Dexterity (sabotage) or Intelligence (security) focuses, and either the Burgalry or Freerunning talents. I’ll go with Intelligence (Security) and Burglary; they mesh well. At this point, I’m going to use my free ability swap to trade Carrie’s Strength and Intelligence; she’s got a lot of Intelligence focuses, and as a thief I don’t want to lower her Communications or Perception. Finally, we’ve got to determine Carrie’s Drive. Two more six-siders gives us 6 and 5. Carrie is a Savior. She sees some clear evil in the world and works to spare people from it. Given the Family-oriented campaign and her career as an acquirer of important things, we can safely assume that Carrie is a true believer: she believes in the inherent superiority of the Family and their rigid social order. She’s a follower, and at this point I start poking the other players to see whose agenda she clings to and supports without question. Thanks to her Drive she gets either the Command or Inspire talent (let’s go with Command), and a bump to either her Health, a Relationship, or Resources. I’ll go with an extra Relationship slot, and save that for another player who plays a Family scion. The Morrow family has served the Quinns for generations as lawyers and bureaucrats, but Carrie Lilah Morrow serves in a starkly different capacity. Firmly believing in the principals of social Darwinism, she knows that her elevated position is a result of her family’s hard work and superior skills, and by extension the Quinn’s must work harder and be possessed of even greater survival traits to flourish in the harsh modern world. She has seen the world outside the Family estates and comfortable Serf residential blocks and know that people—those people who refuse to respect the system—fight and kill over the most meager scraps rather than accept the Family’s generous Labor Reward Point system, and the Quinns need to be shielded from the harshest of those realities if at all possible. Attending school alongside the next expected Family leader, Amelia Quinn, Carrie made an eager sycophant and enabler, doing whatever dirty work the Family scion found beneath her or wouldn’t want traced back to her. She still remains at Amelia’s right hand, now serving the Quinn family as a spy and saboteur. Carrie probably has a lot of growing and eye-opening ahead of her in this campaign. It should be fun!